The Spectacle of Trees is an annual fundraising event where local non-profits decorate a tree with unique gifts. These beautiful trees are on public display from December 2nd through December 15th to help you get in the holiday spirit at the Cape Cod Mall. On December 15th, one lucky winner will be chosen to go home with the tree and all of the gifts! For your chance to win, you can purchase "tree bucks" - each tree buck is a donation to the organization and an entry to win the tree! 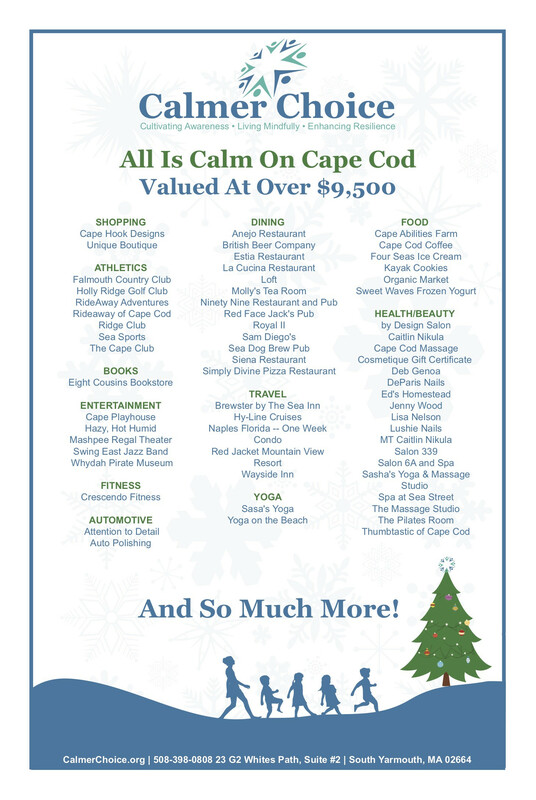 This year, the Calmer Choice tree theme is "All is Calm on Cape Cod." Our tree is currently valued at over $9,000 – with donations from over 60 companies! Our tree is sponsored by Unique Boutique which offers distinctive jewelry and accessories at their store in Mashpee Commons. Unique Boutique has graciously donated certificates that will make your holiday shopping easy and exciting. Gifts include the use of a condo in Naples, Florida for one week as well as a weekend accommodation at the Red Jacket Mountain resort in North Conway, New Hampshire. You'll also receive ferry passes so you can travel to Martha’s Vineyard and Nantucket. While sailing to the Islands you will be able to read your new book you got with a gift certificate. The tree has more than ten dinner certificates worth over $400 at restaurants in Dennis, Hyannis, Falmouth and Mashpee. After you have gone to dinner you can enjoy several entertainment options: 2 different one-hour band performances at your choice of location, tickets to a June performance at the Cape Playhouse in Dennis, and movie tickets at the Royal Theaters in Mashpee. Before dinner, treat yourself with the numerous spa, salon, massage and yoga certificates you'll win. And make sure your vehicle is looking its best with the certificate for a custom polish. Like to play golf? You will enjoy your outing at The Ridge Club in Sandwich, The Cape Club in Falmouth and Holly Ridge in Sandwich. Golf not your game? Then you can take advantage of Kayak rentals or use a certificate for a fitness membership. After all these activities you will probably need a snack. Use your certificates for ice cream, coffee, cookies and yogurt to finish it all up. What's not to love? Buy Tree Bucks for your chance to win while also supporting Calmer Choice. Win over $9,500 worth of prizes!